It is scary in the Twilight Zone kind of way all the 'oddities' around this post (read on) such as this one: This is my 700th published post in five years. I did not plan it to be that way. Huh! So I decided to go on Instagram to see how many followers I have.... 850 as of Monday, September 17. Another round number! The first tutorial that I know has been helpful to a lot of people is joining the ends. I first learned this when I took a class making a sewing machine cover. Prior to that, I'd been doing the messy, bulky way of tucking in the final end into the beginning end. This is something I first saw on Alex Anderson's Simply Quilts HGTV show. I trim my HSTs to size this way ALL the time. HSTs are wonderful little units; one can create a myriad of design possibilities using them. There are many ways to construct them, only one (until now!) way of trimming them up! You can see another example of this tip in action in this post, Some Blocks and a Quiche. There may just be a pretty awesome quiche recipe in that post! This is a life-changing technique I learned from Joanne at Canuck Quilter Designs. If you avoid paper-piecing, and one of the main reasons is because of all those pesky papers to rip off, and even peskier bitty bits of paper that invariably get caught under your stitches, requiring tweezers to pick them on out, then this will change your life as it did mine. There is also my own tip (don't you love tips within tips?) about saving fabric when doing PP, another reason I used to not like it at all. No more! Make templates using the PP template itself! I'm so glad to see that Cindy of Stitchin' at Home, whose pattern I am doing for the October Island Batik challenge, now that I woke up from yet another menopausal brain fart and realized paper-piecing challenge is October, anyhow, she uses the templates fabric-saving technique in her newest pattern, yay! 4. Making a Flanged Binding at 2 1/4"
This is a fantastic binding technique, one I use a lot! I believe it was Tish of The Madd Quilter who put me onto it. My only issue with it was that it makes for a slightly wider than 2.5" binding, and that it covers points if those points lie right at the quilt's edge. I figured out how to make it 2.25". The flange still will cut off the points every so slightly, however. That sounds like duh, right? Think again. When you want a 2" finished HST unit, you need to cut each HST from a square that is 2 7/8", correct? Ergo you need a 2 7/8" wide strip if you are cutting several. No more, and yep, you can use your 2.5" precut strips thanks to this little gem of a technique I learned from Pam and Nicky Lintott, authors of many books that use precuts. This is was the hill I chose to die on during this year's New Quilt Bloggers' Blog Hop that I co-hosted this year. I mean that figuratively... I cannot stress enough the importance of responding to those kind souls who take time away from their sewing machine and family life to leave you a comment on your blog post. That's #1, respond. How you respond is where the disconnect starts with a lot of bloggers, new ones in particular. No, it is not enough to write your response under their comment on your own blog; you need to respond privately by email. See italicized phrase a couple lines above. If the kind soul has already taken time out of their day, do you in all honesty think that person will take MORE time to go BACK just in CASE you deign to respond to them? Hell to the no? Furthermore, do you think that the kind soul will come back to your blog again? Most likely not; I know I sure won't. Now, the beauty of responding by email is that this often strikes up a connection, a conversation between you and a reader. You might find a kindred spirit, and like I saw somewhere recently, as Anne Shirley of Anne of Green Gables fame said, "Kindred spirits are not so scarce as I used to think." People will generally say a lot more in a private email than they will in public on your blog. I count the many QBL friends I have made, both bloggers friends and non-blogger friends, to answering my comments personally. Generally in real life, if one gets invited over for supper or coffee, one reciprocates. So if another blogger has visited you, be sure to visit them, and leave a comment. See reasons in #1. First, beware of having too many; they end up being irritating and I often will either skim or leave if that happens when I'm reading someone's post. Second, ensure they open in a new window! Often if I'm in the throes of a good blog post, and want to see the item to which the blogger is linking, I click it so I have it in my mind, and go back to being engrossed in their post. Often, what happens is that the linked window leads me to another "I just need to check this out", and another....down the rabbit hole I go for minutes... and then where is the original blog post? No clue, or I have to do the annoying time-consuming thing of hitting my back button or looking in the history... Annoying = most likely I will leave and not come back. All platforms have a way of opening your links in a new window. If you don't know how to do something in your blog, Google it. There is no excuse for ignorance (as in not knowing) these days, as my husband, the infamous MacGyver says, and I echo his words. Before asking, "How do I number comments?" Google it. However, a half hour of searching when doing my last giveaway brought nothing pertinent up when it disappeared after they updated the whole email business in blogger, so that is why the giveaway is a Rafflecopter one here! Sidenote, if you do know how to number the comments again, tell me! If you can't find info on it by Googling, then ask a blogger friend! A little glimpse into your personal life makes you more of a real person, rather than a machine that just posts finish after finish. Not all of us are comfortable putting personal stuff out there, but you can control it, right? A glimpse of your sewing space, a fur kid on a quilt or doing something funny, maybe once in a while talking about something other than quilting that interests you, showing a mistake and what you learned from it, or telling a little about where you live without specifics if you prefer, all contribute to your readers feeling like they know the person behind the quilts a little better. I know, I know, five is the number, but 2 is really small and kind of goes with 1... Laughter is so important. In real life, amongst friends, amongst family, between husband and wife. It can mend so much. Both my parents had (how I hate the past tense there) a great sense of humour, and my Dad especially, was one of the funniest people I have ever known. Making people laugh makes a connection again, and that is one of the most magical things I have discovered with my blog, is making connections. Well how about that? When I went into my Stats, where I rarely look, as popularity is and never will be a reason why I blog, but I was curious to see which were the top blog posts for this post, and whoa! I am nearing 500 000 (another five!) page views all time history. Cool! Still a small fry though. Keepin' it real. The Rounded Edge Bag Tutorial! Like who knew? It is on Totally Tutorials April 19, 2015. Here's a tip: if you have a tutorial that you think is a good 'un, you can send it to Kym and she'll let you know! I had no clue it would generate that much traffic. I do believe if I hadn't put it out as a PDF on Craftsy, that my House Block tutorial (affiliate link) would outdo the Rounded Edge Bag because it is by far the most popular download in my Craftsy Store, more than double the amount of downloads this year as for Pocketful of Sunshine (affiliate link), which is a very popular free download as well, and features a little later in this post! Quilter's Laundry Day Blog Hop! Again, who knew? This was such a fun QAL and blog hop, and one of the first minis I hung in the loft (1.5 storey house and I sew in the half storey) when we moved in here last year. 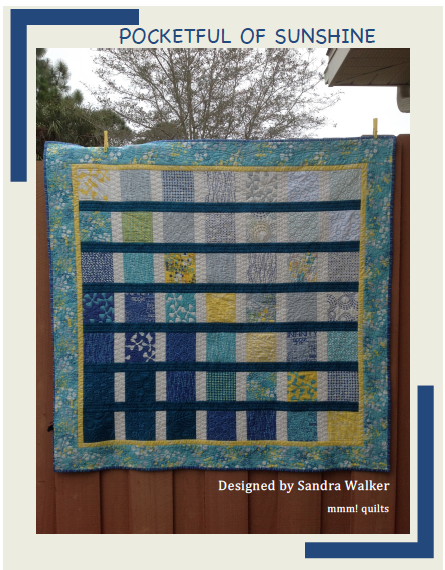 The pattern was designed and the blog hop run by Jen of A Dream and A Stitch and Jan of Color, Creating and Quilting. Oh! Too funny, so I started typing Janice's URL and it pops automatically up, which tells you something, 😉 and what is her current post about? My house block tutorial that she's making for the RSC challenge! Wee-ooh, wee-ooh, à la Twilight Zone! 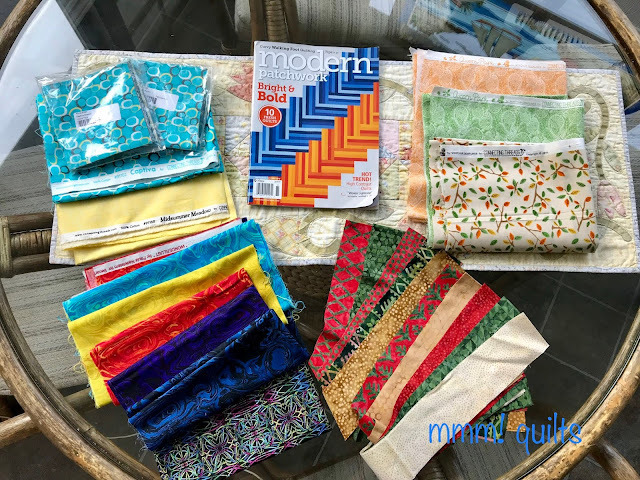 I should mention that my Postcard from Sweden blog post announcing the QAL I was co-hosting with Helen of Midget Gem Quilts was a very close second to Quilter's Laundry Day. Wow, this is a shock! With over 5000 page views, 😳 it's my Freefall QAL. This was my first QAL I ran on my blog, using my own pattern (that needs to be finished writing and uploaded to Craftsy. I procrastinate big time on pattern-writing, if you hadn't noticed.) I know the colouring page has gotten a ton of downloads. All the instructions for making the wallhanging size are here on the blog. If you click on the link you'll find them. Another lovely surprise was finding a photo uploaded with a nice comment on Craftsy (affiliate link to my store) from a person who had made the quilt using my pattern, just didn't participate in the actual QAL. One of the first things that popped into my mind for this Favourites category was the Mini Round Robin I participated in in summer 2016. My quilt is called Quilter's Retreat. This little group of four activity came about because of #2 below. Cindy of Stitchin at Home wanted to do a summer project to help take her mind off things that were worrying in her personal life. I love all four of the final projects. I participated in 2015, and it changed so much in my quilting life! It led me to Tish and to Cindy, two of the participants in the Mini Round Robin. Julie of Pink Doxies, the fourth mini round robin-er, I'd already 'met' and I convinced her to join in the NQBBH as well. I met so many interesting wonderful bloggers, many with whom I am still in touch on a personal level. 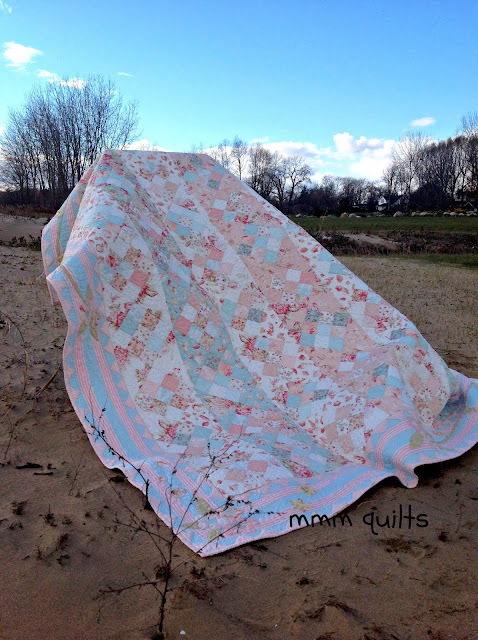 I highly recommend this if you are a new quilt blogger. I'm pretty sure that is where I met Bernie too, and I know it is where I met Helen of Midget Gem Quilts, and Lisa of Sunlight in Winter Quilts. Joining Instagram on February 2, 2016 with a post of my fabric pull for Radiance, my Triangle Transparency quilt designed by Yvonne of Quilting Jet Girl, gave a whole other instant spin to the QBL world. Co-hosting with Lisa in 2017, and then solo-hosting in 2018 the #30quiltdesignschallenge was another game-changer and worthwhile endeavour. Several of my published quilts have come from designs done in that challenge. I know of several other participants whose designs in that challenge have been published and that makes me happy! Opening a Craftsy Store, mmm! quilts and an Etsy shop (which needs work - I need staff lol) was another exciting a very worthwhile 'scary' venture. Craftsy is really wonderful as far as they don't charge a designer one cent to sell her patterns through their platform. My next scary venture is opening up a Payhip store. Just as in yoga, there's always somewhere to go! Participating in blog hops has been so very rewarding. I've participated in many, some for fabric companies like Benartex, Paintbrush Studio Fabrics, and Island Batik, some for book launches (Lara's Crafted Appliqué and Cheryl and Paige's Modern Plus Signs Quilts and others for fun, and I've not been disappointed once. The experience has always taught me something, (I learned how to schedule a post just for one example), I've met new people, I've tried new techniques, and pushed my comfort zone too. "Kindred spirits are not so scarce as I used to think." 3. A copy of Modern Patchwork, in which you will find my fifth published quilt, In the Shadow of the Plus. 4. A 1.25 total yards (.5 yard/.5 yard/ fat quarter) group of Acorn Park fabrics, Autumn/Fall themed, from Connecting Threads. 5. Five item bundle: Two charm packs of Captiva by Connecting Threads, with two .5 yards of coordinating yardage that should give you a great start on this pattern: Pocketful of Sunshine (affiliate link but the quilt pattern is free ha). If you haven't downloaded it and don't feel comfortable doing that, I will send you the PDF to your personal email. To win any one of these five prizes, leave me a comment telling me what your favourite thing is about my blog. Followers may have an extra chance; you'll see in the Rafflecopter widget. Thank you again for reading, period. For being with me over the past fun times, and some not so fun times, for your support, your care, your encouragement and acceptance. I sit at my laptop for hours (literally, especially this post) writing to 'you' and when I hear back how a reader found something touching, or funny, or that they could relate to, well, it just warms my heart, truly. I feel so very blessed by all the goodness this blog has brought to my life. I will do my best to respond to all comments. I do have a surprise and a gift for all of you: I'm super-excited to announce the release of my second pattern, On the Plus Side, which was my first publication in Modern By the Yard, Benartex's ezine. You can get the current issue (free!) at that link, which has another of my patterns, Wildflower Pinwheel Placemats, in it. A massive thanks to Cheryl of Meadow Mist Designs who proofed and offered wonderful suggestions for improvement in an incredibly short time today, Monday, I am able to write in this post that the pattern is available now instead of, 'Sometime later this week..."
I'll be linking up everywhere; check the links under the Linky Parties & Activities tab. Congratulations. I love your pink quilt. So soft and pretty. I like reading about your quilting adventures as well as the human side of you. Well firstly Sandra, many many congratulations for reaching 5 years of blogging! Truly impressive. What do I like about your blog?.....pretty much everything. I love your quilts, your quilting and your sense of humour. Straightforward, fun, accessible, beautiful.... and your blog's pretty good too! haha. Maybe the thing I like most is that it is always interesting, and that you often show your process and progress. And that you're always up for a bit of an email chitchat. Anyways, I did a quick check and it seems I follow you on email, IG, pinterest, and yup, bloglovin' as well. In most contexts I reckon that'd be considered stalking......anyways, enjoy your 5-year party my valued quilty friend. Congratulations, Sandra! My favorite thing about your blog? I get to connect with you each time you post (and inbetween, which is wonderful). It's like sitting down with you in person, to laugh, share ideas, chase squirrels - heehee. Along with that, you inspire me to chase my own ideas for quilts and you are such an encouraging friend. Yay for your second pattern release too! Happy Anniversary! My favorite thing is your tips & tutorials. Favorite thing about your blog? That you respond to comments and feel like my friend next door! Now if we were actually neighbors, we could get together and do those yoga exercises regularly. That's how I remember getting acquainted with you! Wow...5 years! Celebrate, enjoy, KEEP GOING! Congratulations indeed. I love READING your blog...not just skimming through the pictures. I enjoy your perspective and personality coming through along with your creativity. As I write...my cat is sitting on your Plus quilt I made. Also, do you recall the name of the pattern for that pink quilt above? It's lovely and would make a great pattern for scraps. Congrats, Sandra!!! Your blog makes me smile and even makes me laugh out loud! Love your squirrelly ideas. So many great tips going on here. Thank you! Happy, happy anniversary! I'm glad you decided to give blogging a try. I second and third everything you say about comments and so appreciate the conversations we have had via email. I look forward to what you have to share over the next 5 years!! My favourite thing about your blog is when I first started following you, you had just finished your Beothuk Star quilt, and told about Shanawdithit, the last of her people. It's an ugly part of history that we often want to ignore, and you could have displayed your quilt without ever mentioning her name and her fate. But you did. Congrats on five years and here’s to the next five of great posts. I especially like that you always reply to my comments via email. One day I really hope to meet you in person, probably at Quilters Dream. Congrats. I love your tutorials. Thanks so much for the blogaversary prizes. 5 years is not a very long time and you've managed to get so many followers and published so many patterns in that time. Congratulations. Congrats on 5 years. thanks for spending your time sharing tips and tutorials with us. Congratulations on your blog anniversary! 5 years is a great age ;) I love your 5 favorites! I will continue the quilting adventure with you, still following and enjoying you patterns, and posts. This was a great post. I love tips, tutorials, seeing your work, and your writing style. I rarely comment but will try to improve on that! Congratulations on 5 years of blogging! I always find your blog posts interesting and entertaining to read. My favorites are photos of your gorgeous projects and tutorials. I look forward to seeing what you come up with in the NEXT five years! Sandra: I love your blog and think it's wonderful to find out you've been blogging 5 years with 500 posts!! I think I discovered you in 2015 and I look forward to each and every post. I can see how you have evolved and bloomed as a quilter, pattern designer and all around great person. Your caring and and sense of humor are so appreciated. Thanks for taking the time to share. I love checking your progress on your quilt goals and just reading about your projects! Congratulations, you are always very generous with your tutorials. Great directions. I love your tutorials and the conversational aspect of your blogs. Always enjoy reading them. Thank you for sharing so much. Congratulations on a tremendous achievement in blogging. Congrats on your 5th anniversary!! This was a great blog post, it has so much good information in it, I know that I will return many times to read. Thanks for all your patterns, free and otherwise, just a great blog!!! Congratulations on your 5 year anniversary! I enjoy seeing your quilts and reading about your life. Congratulations on your 5 years. I haven't been following your blog very long. I found it through the Island Batik blog hop, but I loved seeing what you had made and wanted to see more. My favourite part of your blog, you share patterns, quilt alongs, and family life, and I feel I am a part of all that. Sharing is the word I choose. Happy Blogoversary! I've only been with you for a little over a year, but I've enjoyed every minute of it. My favorite part of your blog is how you choose to be upbeat and supportive, to see the good in the world. Of course bad things happen, but you are the type of person to move forward through the bad and work toward making the world better. More beautiful, more happy, more aware. Here's to many more happy years of quilting and friendship! Congratulation for the blog anniversary! I am following your blog since a few months now. What I love in it? 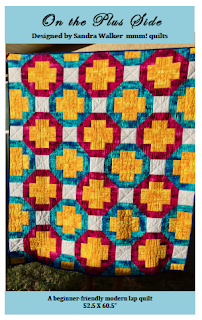 the quilting inspiration, the tips and tricks and the way you tell the story. I hope to be following you fr the next five years at least. Only 5 years? You and blogging are such a perfect fit, it seems as though you’ve just always been there! Congratulations. I'm proud for you. My favorite thing about your blog... It sounds ridiculous, but it changed my life... you know that, my dear kindred spirit friend. The spirit of your blog guided me toward a huge life decision, and I am so glad. And guess what... I made that decision exactly two years ago tomorrow... Yep, September 19, 2016. Happy Anniversary Sandra. What I love about your blog is your enthusiasm and the way you jump in, boots and all! Also love seeing pics of your pretty cat, and reading about the famous McGyver. Wowsers five years and look how far you've come my friend! Congrats and here's to many more years ahead. Congratulations on your five years of blogging, Sandra! I've only found your blog within the last year, but I really enjoy your quilting adventures, your great tips, and the fact that you share from your heart! I noticed you when you had a yoga post. I had signed up for your newsletter before that, but remember you for the yoga (and I don't do yoga.) I stayed because you always have something interesting to share. Congrats on your 5 years! I love your post today w/ all the fives - Thanks for the tips! I love reading your blog as you have a lot of inspiration in it and always something fun and humorous to say! Congratulations on hitting your 5 year blog-iversary, Sandra! I'm so glad I found your blog! My favorite thing about your blog is that when I read it, I feel like I'm hearing your voice, and coming from a former 5th grade teacher, that is something I tried to teach to all my students as being so important! I just found your blog recently and I have enjoyed your stories as well as seeing what you are working on. I have not had much time to sew lately, but I am inspired by reading your blog. Your quilt at the top of this post is lovely. Congratulations on your anniversary. I really want to make the leaf quilt but with 10" blocks. It's on my list to do. Woohoo! 5 years already? I enjoy reading your blog to visit you and see what creative work you are up to. It's always something good that makes me smile and think "I need to make one of those too!" Even your yoga posts get me into body contortions I thought I'd never find myself in. Coming here is like visiting a friend! What do I love about your blog? Why the quilts of course!! I haven't followed you for very long, but I love seeing what you are working on. I love your tips & your humor. I follow you by email. I can't remember how I first found you. I think it was a referral from another blogger but I can't remember who. Congratulations on your anniversary! Five years is an accomplishment of which you can be very proud. I am new to your blog (only a couple of months), but I love your tips and encouragement for quilters at different skill levels. I am a beginning quilter and have so much to learn! I'm on Bloglovin, but I usually follow you by email. and would reach out to new bloggers, our Sandra. Congratulations on your blog over 5 years. 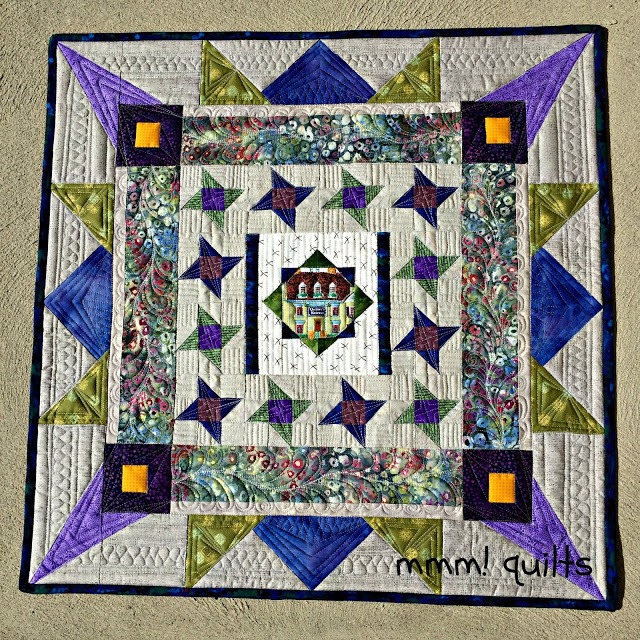 I love the way you photograph your quilts and the gorgeous colours you use. Even though I don't (yet) do yoga, I always read when you describe the poses; something about you living in Canada is a plus - been there briefly only once, would like to visit again. The fact that you were one of the first people to comment on my blog was a great boost to me. And your great quilting progress is inspiring, thanks for the whole package. Congrats on 5 years! You always have something funny to say:) And of course I always enjoy seeing what you are making! Congrats on 5 years and thanks for the 5 categories of helpful links. Like you said in your blogging hints, I like that I can connect to you as a real person. Happy Blogaversary, my friend! Hard to believe time flies so quickly. You've accomplished so much over the past 5 years and I'm so stinking proud of you! Congratulations on five years of blogging. Lots of lovely stats in your post. Congratulations on celebrating 5 years of blogging! Love your conversational posts... I feel like you are talking to me personally, which is really cool! I’m heading back to check all those links you shared...thanks for refreshing my memory! Congratulations, Sandra! I learned about your blog when Yvonne (Quilting Jet Girl) mentioned your yoga for sewists. I was hooked. I hadn't practiced yoga since retirement and found I missed it so much. Now I practice my yoga daily before my quilting and sewing time. Thank you! I enjoy your tutorials and helps as well as your general posts. I mourned Rocco with you as I missed all the pets who enriched my life. Best wishes to you--keep blogging! I feel like I'm having coffee with a friend. I cannot remember when I first discovered your blog (I have been following for a minute) but I have enjoyed your sharing, your tutorials, your humor and your creations. I follow your via Bloglovin and IG. Congratulations on your blogging anniversary. It's great that you are still enjoying it and are willing to share. mazel tov on your 5 years, heres to another 5! i'm not sure what i like "best" about your blog, but i do know that it's one i always open to see whats up! thanks for sharing! p.s. I follow by email. I like learning new things! I just learned how to quilt this year and I want to learn more! Congratulations and looking forward to many more years. There were so many great things in today's post, it is hard to pick one. Sandra my favorite thing about reading your blog is the way you inspire us to stretch our limits, try new things and learn new skills by using your humor, numerous links to tips and the great photos and tutorials. Thanks for being a Canadian part of my quilting life. And now the funniest news......I just realised that not only do I follow you, but I have been bookmarking several of your posts so I can easily find them again! enjoyed reading your blog since then. You really seem like a friend to me! I love that you reply to my comments, I love that you give us blogging tips (I didn’t know that about the windows in links, although I do tick the box, tee hee) ..... your tips are so helpful! Well done on all your quilting accomplishments, and especially on the release of your second pattern! A great post Sandra, and a very generous giveaway! What first drew me to your blog is your website name. We menopausal women have to stick together. I really enjoyed this post. I have been thinking of starting a blog and you have some great suggestions. Thank you. Congrats on your 5 year blogaversary! Love your lists of the top 5, especially your blogging tips. I haven't been following for that long, but it's always fun to come see what you are up too. Congrats on the new published pattern! Have a great weekend! Congratulations Sandra! You can leave me out of the giveaway please, but I do love reading all your adventures. Don't always leave comments (because I read it through Bloglovin in the morning, and that's a thing in itself), but I do read and enjoy the blog. Congratulations on your pattern successes, too! Congratulations on five years blogging. I love your positive optimism. There are a couple of reasons I really enjoy your blog. There is so much information and eye candy that I look forward to the simple act of sitting down with coffee for another enjoyable read. I’ve used some of your advice and always found it spot on. Also, you are Canadian and not just Canadian but from Ontario! ME TOO! :0). It’s nice to read a blog by another Canadian quilter. There aren’t enough of those! Congratulations on your anniversary! one thing i like about your blog is it is always upbeat, funny, and lots of good tips. What I like about your blog is that you just sound like a friend--and you have many interesting ideas and thoughts! Forgot to say, I follow you on Bloglovin'. Anne Shirley was a very wise girl. As is yourself. It was lovely reminiscing through all the highpoints, and there have been many, of your blog. The girl done good Sandra. Congratulations on five years. I didn’t realize until reading your post that I will have been blogging for five years this November. I’m waaay behind on blog reading, and this post will definitely need a leisurely go-through with a cup of tea (and a “windmill” cookie or two). But I wanted to pop in with congrats on 5 years and on your wealth of knowledge and tips to share. It is all such a treat! Congratulations on your blog-versary! This was such a fun post to read. Thanks for sharing all that. Congratulations on 5 years of fabulous blogging....what an intereting post - I'll come back later and look up some of the links you have shared - there's lots to explore. I so agree that blogging is a two way thing...I really have to get back to the spirit of it all again as we readjust to our changing family and lifestyles (weekends were my sew-days, now they're full of impromptu family time for example) (not a bad thing, like I say, I just need to make a few adjustments! ).